What does it mean to be a grandparent? I never thought much about that question until Laura and I turned our parents into grandparents with the birth of Julian. Julian is now two and his sister Celeste is one. My ability to observe their relationship with their grandparents has enlightened me in my role as both a parent and child. Grandparents are hardwired to smother grandchildren with love, and young grandchildren innocently soak it up. That combination becomes a powerful window into what makes families tick. Which is why I enjoyed the latest Heritage Time Machine project in the Sony DigiDads program. Using a Handycam HDR-XR500 on loan from Sony, I captured some spontaneous moments with Julian, Celeste and my dad (Edd “GrandEddy” Kalehoff). 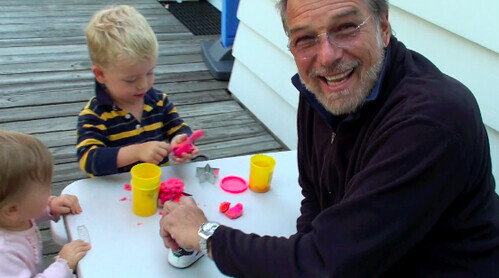 Then I sat down with my dad to ask him a few questions about what it means to be a grandparent. It’s important to record these sorts of things because you surface facts and ideas that otherwise would’ve gone concealed. Of course, we’ve also created an artifact that future generations of family can enjoy — so long as Google and YouTube live on. I create a steady volume of video work, but this project underscored that I need to record more family experiences. Below is the video, and below that are a few notes from my experience with the Sony Handycam HDR-XR500. The Good: I was very impressed with the Handycam HDR-XR500‘s picture quality, low-light performance, sound, stabilization software and even the built-in still-camera. This camera is evidence of how quickly the gap between pro and amateur/consumer video equipment is closing. The camera has a built-in 120GB hard drive, which Sony claims can hold 50 hours of video. 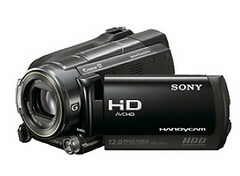 One call-out feature of Sony’s new Handycam line is a built-in GPS that enables a map-index capability for your video. I can think of a few niche instances where this might come in handy (like documenting a sequence of extensive travels), but for most purposes it’s just another feature to fiddle with. The video clips were easy for me to import into Apple iMovie, my preferred video editing software, though one of the video clips registered as an “Error”. The Bad: Much of the Sony navigation was similar to my past Panasonics; that similar experience reduced the learning curve to get up and going. But that’s not necessarily a good thing: this video camera was far from a point and shoot device, as evidenced by wife and son’s inability to figure it out on their own. There’s a lot of functionality hidden behind layers of LCD menus, and a lot of buttons, wires and connections to figure out. (And if anyone can figure out what the HDR-XR500 name means, please let me know.) These feature hurdles are no big deal for serious amateurs, but are for many others. To be fair, featuritis is by no means limited to Sony — it’s a broader consumer electronics problem. Disclosure Of Video Camera Bias: I’m not a “professional” cameraman or video producer, though I create a lot of video for personal and work projects — typically interviews with interesting people, and a few wedding videos here and there. A few years ago I migrated from Panasonic digital video cameras to point-and-shoot Flip cameras. Flips are highly practical for my needs: well-designed (like Apple products), pretty good video/audio quality, dirt simple and have no ancillary parts. And they’re so low-cost, tiny, lightweight and replaceable that I tend to always have one on me — which means I’m always prepared to shoot video. Importantly, I find the greatest video is determined less by the camera, and more by the cameraman and video editor. So where does that leave the Handaycam HDR-XR500? I believe it’s an awesome, high quality device, and worth every penny in the $1,000 price range. I’ve paid more than that for video cameras in the past, and would be proud to include this camera in my arsenal. But on most days, I wouldn’t get much use out of it — primarily because it’s too big to fit in my pocket, and I’m too paranoid to carry such a costly device with me everywhere, all the time.Â However, the Handaycam HDR-XR500 has its place for people who demand very high quality output. This post is part of series called the â€œSony DigiDads Projectâ€ by Sony Electronics where a group of dads, including C.C. Chapman, Jeffrey Sass, Max Kalehoff, Michael Sheehan, and Brad Powell, have been given the opportunity to test and review Sony gear. If you want to know more about this project, visit the Sony Electronics Community. Love the video. Got any chocolate? Classic!! Your dad is obviously a VERY happy Grandfather which is always an awesome thing to see. Also loved the laugh track!